Instructions for watching this animation, and links to download “The Map,” can be found below. Slow Internet? Click here to view the “Slow Internet” version of the presentation. 1. Click the play button in the center of the shaded box (above) to start the video. 2. Click anywhere on the video to pause it. 3. Click the icon at the bottom right of the player to view it “Full Screen. 4. “Click and drag” the videos to resize either frame of the screen to your liking at any time during play. 5. Click any one of the MAP images below to view a larger version or to download or print. Each map contains the same information. They only differ in appearance. Please select whichever you like best! 6. Click “ESC” key to return to this page. Bonus Tip: If at any point the video and sound seem to become “out of sync,” quickly pause then resume the video. The presentation should then sync-up. Training Schedule Suggestion: This animation has a natural break at about the 10:04 time-code mark. If you want to stop the animation here and discuss what has been presented, this would be a good break point. The first half discusses the five boxes while the second half looks at the Solution Box and Anger Box. The purpose of this animated presentation is to introduce you to the numerous stages of the TPM process, walk you through “the map,” and show you how to use it. The information that will be covered should help you familiarize yourself with the TPM process and offer the necessary tools and understanding to help you determine where you are in a TPM session, as well as what steps to take at any point along the way. The TPM “process” the how-to-do-it- portion of Transformation Prayer can be explained using different analogies. The two that you will encounter throughout your training are the “Boxes” and the “Map.” This video primarily uses the “Map” illustration. Other videos and articles will use the “BOXES” analogy. Also, know that many concepts and principles are briefly mentioned during this presentation that are more fully explained in other parts of the training. If you are not familiar with some aspect of what is presented, click any hyper-link provided or search through the training (using the search tool) for a fuller discussion of the concept that you are unsure about. There is always more to learn, as well as room for improvement, but if you can gain a solid grasp on the concepts that will be presented here, your ministry sessions should be consistent and successful. The text that follows is a near word-for-word transcript of what is presented in the animation video. You can print it out (as you can any and all of the training made available) and follow along to increase your comprehension if you choose. As with all of the articles and videos, one time through will never do! Re-visit everything over and again. Become the “sharpest tool” you can in the hand of God as you seek to do His ministry. 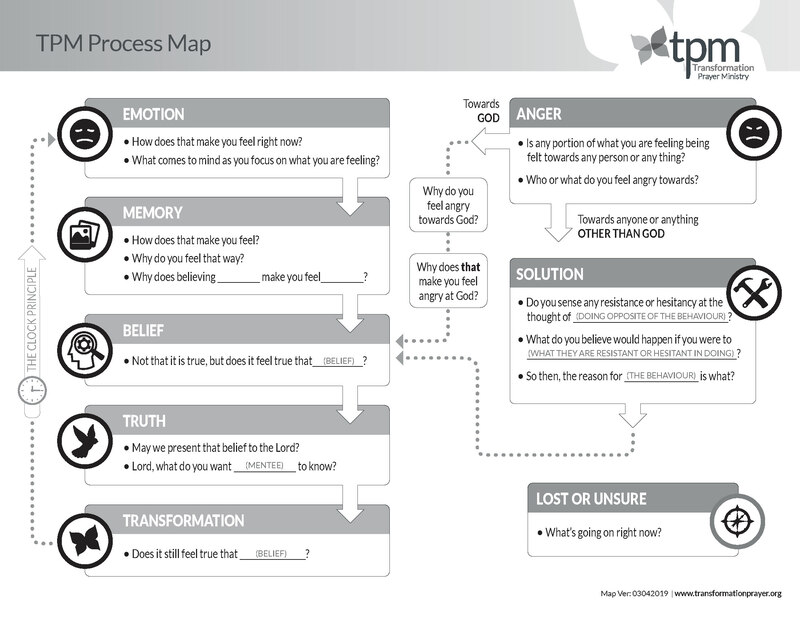 There are five essential stages (boxes) in the TPM process; EMOTION, MEMORY, BELIEF, TRUTH, TRANSFORMATION. Every ministry session begins in the EMOTION Box. There is no need to search for a MEMORY. Our mind’s do this automatically by way of association. When the appropriate memory comes to mind we are in the MEMORY Box where we proceed to identify the lie-based core belief that is producing our negative emotion. Once the lie has been identified we proceed to the BELIEF Box. Once belief is confirmed we move to the TRUTH Box where we ask the Lord for his truth and perspective. Finally, we check to see if there has been a change in what we believe in the TRANSFORMATION Box. This change/transformation confirms that the Holy Spirit has brought about mind renewal. Occasionally, a session may seem to become difficult or even “stall out. When this happens (and it will), we may have to move out of the five essential stages or boxes over to additional boxes we call the ANGER Box or SOLUTION Box. These two “boxes” are designed to deal with anything that hinders us from moving forward. Each box on the map contains intentionally-crafted questions that are to be asked at specific points during a session. Each question is ONLY to be asked when we are at the corresponding section of the map. When we know where we are in the process (what box we are in), we will know exactly what question to ask. “The purpose of this presentation is to introduce you to the numerous stages of the TPM process, walk you through “the map,” and show you how to use it. The information that will be covered should help you familiarize yourself with the TPM process and offer the necessary tools and understanding to help you determine where you are in a TPM session, as well as what steps to take at any point along the way. There is always more to learn, as well as room for improvement, but if you can gain a solid grasp on the concepts that will be presented here, your ministry sessions should be consistent and successful. Let’s start with the fundamentals. Although these five stages represent the entire process of TPM, there are a few additional areas on the map that need to be discussed. These areas include the sections where we apply the clock principle, where we address (what we will call) “solutions,” where we address anger, and where you go when you are unsure of where you are in the process. Each of these elements represents a possible stage in which you might find yourself during the course of a TPM session. This Chart is Like a Map. You can use this chart as a map to help you determine your precise location. You will soon discover, if you know where you are on the map, you will also know what to do and exactly what question to ask. This effectively takes the guesswork out of applying TPM and offers the needed guidance for when you are unsure of what to do next. Each section on the map contains intentionally crafted questions that are to be asked at specific points during a session. Each question is ONLY to be asked when you are at the corresponding section of the map. These questions are not “magic words” that bring about forward movement or transformation. Rather, they function, more or less, as reminders that bring certain concepts and principles to the mind of the recipient. When the recipient knows where he is in the session and what steps to take next, he then moves forward. It is the recipient’s belief and choice that cause him to move forward; not the facilitator’s questions. Most sections contain one or two questions, whereas a few have three, but even then, if you know where you are on the map, it is quite simple to determine which of the questions to ask. As you are now likely beginning to realize, the primary challenge for the ministry facilitator is knowing where he is on the map. All sessions begin with EMOTION. The goal here is to connect with emotion. Without feeling something, no forward motion can occur. This is commonly accomplished by simply “telling the story” of a recent time in which you felt negative emotion; such as when your boss confronted you, when you were cut-off in traffic, when you opened your credit card bill, when you were asked to volunteer at a local charity, when you were forced to enter into conversation with “that guy,” or when you unsuccessfully attempted to put your children to bed. By “telling the story,” emotion will typically surface. You will again feel what you felt at the time. When this occurs you are ready for the first question in the Emotion section. This question should help you to connect with your emotion. At this point, a memory will likely come to mind, and you move to the Memory section of the map. If this does not happen automatically, don’t panic. You would simply follow the procedure in the Solution section of the map. But more on that later. There are three questions to be asked in the memory section of the map. One question is asked in response to a stated emotion, another is asked in response to a stated belief, and the third is asked when the recipient’s responses begin to repeat or “loop.” These three questions are designed to help you to identify the lie-based core belief that is causing you to feel what you are feeling. Note: These three questions do not have a sequential order. Each one is asked based on the information that you receive from the person. Each of these questions is designed to either help you to focus on what you are feeling or identify what you experientially believe. “Core Beliefs” consist of what we experientially believe regarding our “self-identity” (who of what we are) and our “state of being” (our situation or condition). Note: There are expanded discussions about this in other articles. These beliefs are “located” by paying close attention to the emotions that they produce. If I “feel” as though I am worthless, it is because I believe that I am worthless. Likewise, if I “feel” as though I am alone, it is because I believe that I am alone. (and so on) After asking the necessary questions and identifying a potential lie-based core belief, you then move to the Belief section of the map. This question is asked to determine if the stated belief is, in fact, experientially believed to be true. Asking the question in the Belief section establishes a “baseline” which we will use later in the Transformation section. After this question has been answered in the affirmative, you are ready to move to the Truth section of the map. There are two questions in the truth section. One is addressed to the recipient, while the other is addressed to God. The first question is essentially proper etiquette and reminds the recipient where we are in the process. It is a transition question which shifts our focus from the person to the Lord. “May we present that belief to the Lord?” If “yes,” you then ask the second question. The facilitator does not need to ask any additional questions (such as “what did the Lord say?” or “did you hear from God?”) nor does he or she need to make any additional comments (such as offering advice or sharing insight) while in the Truth section. Since you are now in the Transformation section of the map, there is only one question to be asked. This question is vitally important as it seeks to determine if the recipient has, in fact, received truth from the Holy Spirit. The question is simple. In the early versions of the TPM training, this “test” was accomplished by checking the person’s emotional state. The facilitator would ask the recipient about emotion, rather than belief. We have since discovered that emotion is not a reliable test for transformation as a great many things can influence what we feel. But only God, through His Holy Spirit, can refine our faith, renew our minds, and change what we experientially believe. Because of this reality, the way to check for transformation is simply, “does the lie still feel true.” But a change in experiential belief is evidence of the Holy Spirit’s work in our lives. The Clock Principle is essentially the step in between the Transformation section and the Emotion section of map in which you “check the clock” to determine if you have enough time for an additional ministry session. If you do not have enough time for another complete session, then it might be better spent debriefing and offering additional training. The Answer to the Transformation Question ALWAYS Takes You to the Emotion Location on the Map. No matter whether they report having received truth or not, you move to the EMOTION Box. The question you ask is somewhat modified to fit the situation. It is important to note that no matter how the Transformation question is answered, you automatically move to the Emotion section of the map. There is nothing that you need to do or ask concerning the response to this question. Even if the lie “still feels true,” the next question to be asked is the first question in the Emotion section. “What are you feeling now?” But all of this is dependent upon whether you have time to proceed or not. If at any point along the way, the recipient gets “stuck” or the session becomes “sidetracked,” it will likely be caused by what is referred to as a “solution.” When this occurs you have left whatever box you may have been in and have moved over to the SOLUTION Box. There are three questions in the Solution section on the map. As you probably noticed, this question does not have the recipient “attempt” or “try” to do anything. Rather, the recipient is to “feel for” or “sense for” something; specifically, a hesitance to stop doing what they are doing or a resistance to start doing what they are not. For example, if the man mentioned earlier were asked if he felt any “resistance or hesitancy” at the thought of remembering a particular memory, he would obviously say, “yes.” For to do so would require him to put himself in perceived danger. (…something bad would happen.) Or, if someone believed that by holding onto her grief, for example, would somehow prove that she loved her husband who died 11 years ago, then she would likely feel a great deal of resistance at the thought of releasing the grief. The only thing being looked for at this point is the presence of resistance and hesitancy. The second question is designed to identify the perceived problem. The perceived problem might be something like, “If I remember, something bad will happen.” Or, “If I let myself feel, I will become overwhelmed by the pain.” Or “If I let my anger go, I will be hurt again.” Once the perceived problem has been stated, the next question is to be asked. The third question reveals the lie-based belief that is supporting the solution/behavior. When the core belief has been identified, we move to the Belief section of the map and ask the Belief Question. Alternative wording: “Not is it true, but does it feel true that…? Anger is commonly used in an attempt to “solve” perceived problems. In fact, anger is one of the only emotions that we intentionally use for one purpose or another. Other negative emotions are generally pushed away, denied, or suppressed. Whereas we often view anger as a way to block-out other emotions, empower us to do what we need to do, or “get-back” at someone who deserves our wrath. If anger shows-up at any point in during the process, then this moves you to the Anger section of the map. However, it is important to realize that it is not uncommon for a person to avoid admitting that he or she is angry for a myriad of reasons. And although providing good orientation regarding anger prior to the session is ideal, if the person’s behavior suggests that he may be angry and yet he is not reporting anger, there is a question designed to help identify this “elusive” anger. This is not a question to ask when you do not know what else to do. Rather, it is only asked when you have genuine reasons for believing anger is present, but providing orientation is not a viable option. Because anger is unique from other emotions in that it is typically a protective emotion that is felt towards people, things, and our circumstances, if a person feels an emotion towards someone or something, that emotion is likely anger. If the answer is, “Yes,” then you need to determine what is being felt and who or what it is being felt towards. A typical response might be, “I am angry with God because He did not protect me from what happened,” “He abandoned me,” or “He let me down,” etc. The next question helps to clarify the belief. Note: This question is essentially the “looping question” borrowed from the Memory section of the map. Any belief that has them angry with God is a false, or at the very least, inaccurate belief. From here, the next step is to head over to the Belief section of the map using the person’s response to the previous question as the “belief.” If, however, anger is felt towards anything or anyone other than God, simply head over to the Solution section of the map. Anger felt toward anyone or thing other than God is being used to solve a perceived problem. Using anger as a “solution” to a perceived problem is not uncommon, so do not be surprised if you find yourself here in many future sessions. Such perceived problems might include things like: “If I am not angry, I will get hurt again,” “If I am not angry, that person gets by with what they did to me.” Or “If I am not angry, I will lose control.” Common beliefs that support being angry might include such things as, “Being angry keeps me safe,” “My anger holds him accountable,” or “As long as I am angry, I am in control.” But remember, if the anger is being felt towards God, we ask two questions before heading to the Belief section. And if the anger is being felt towards anything or anyone other than God, we go to the Solution section of the map. These seven sections (Emotion, Memory, Belief, Truth, Transformation, Solution, and Anger) come together to form the map. However, there is one additional place that you may find yourself in a session; that is, lost. If a person is unfamiliar with the TPM process or has little-to-no experience in applying it, it is quite possible that he or she might become “lost” along the way; not knowing what to do. This can be alleviated simply through additional orientation, training, and practice. Likewise, a facilitator may become “lost” in a session for many reasons, such as being distracted by outside interruptions or the recipient not verbalizing what is happening internally. When this occurs, there is a simple way to find out where you are on the map so that you know what to do next. First of all, again, don’t panic. To determine what is happening and where you are on the map, just ask “What’s going on right now?” No matter what is happening at that point, you should then be able to determine what the next step should be. Use the map to find the recipient, and then ask the appropriate question. Get in the habit of using the recipient’s responses to locate “where you are” on the map, and then ask the appropriate questions for that section. If you can consistently accomplish this, you will have simple, successful sessions and a boost in your self-confidence when applying this process. Wow! I love it! Been practicing TPM for about 3 years now and in that short presentation I could see where and how I had stalled out with 2 different clients. This is easily teachable with other pastors in my church who regularly counsel, have taken the TPM classed but never felt confident enough to use it. I really love the professional presentation and voice over… Thank you ! PS I attended last summers training session in Denver and this is even a vast improvement over that. Good Job! What are your thoughts about giving copy of the “map” to the client? 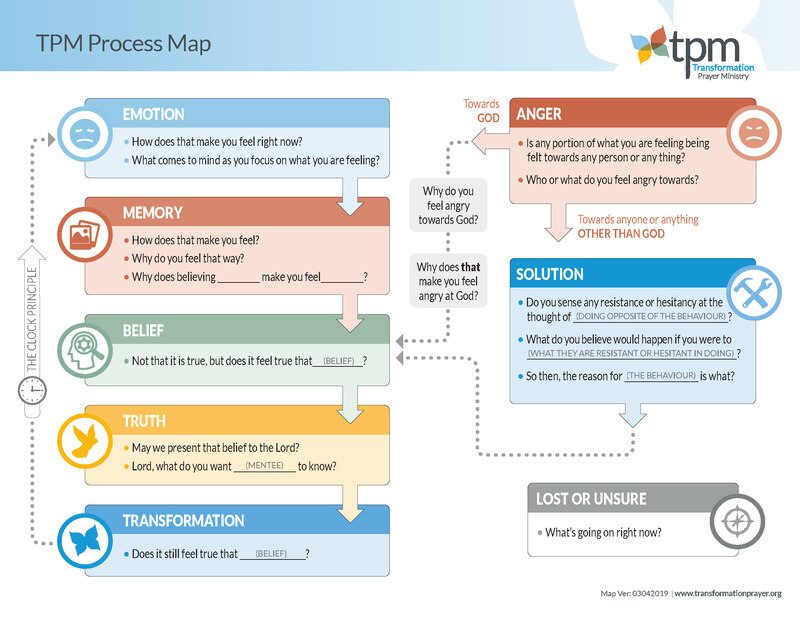 This “map” is designed to help explain the various stages of the TPM process, how those stages relate to one another, as well as introduce each of the questions that are used throughout the process. The goal is to equip whoever is planning on applying this process (either as a “facilitator” or as a “recipient”). It is common practice for both Dad and me to equip “recipients” as much as possible. After all, it is their beliefs, their choices, and their mind-renewing journeys. You may be interested in this article (link below) as it pertains to your question. I hope this helps. And thanks for your involvement and commitment to excellence in ministry. Learn it well and share it with others! This is an excellent teaching tool. I plan on sending it out to all of our past recipients and including it as a “must watch” for new recipients prior to their first session. For facilitators, my favorite quote from you, Josh, is “Get in the habit of using the recipients response to locate where you are on the MAP.” Thank you, and I am still looking forward to viewing a live demo session. BEYOND AWESOME!! Thanks soooooooooooooooooooooooooooo much for this!!!! This was excellent. The examples provided were helpful. My husband, Mark, and I have a TPM team of three leaders/facilitators at our church. All three of us went to the training in Denver and got the materials and we have been using them since the training. We are in the San Francisco Bay Area, Pacifica, California…It is so wonderful to have the training online now! While listening to the video I realize our team has quite a lot of practice now, since the Denver training! It is a great feeling! Thank you again from the bottom of our hearts! This is great ! Everything you add to the website makes things clearer and easier. Keep up the great work! This is extremely helpful. I am about to facilitate a session tomorrow with a friend, and was sitting down at my computer to try to distill the questions at each different stage (based on the supplemental materials) into a simple, visual form. Then I saw the email with a link to this map and was so happy to realize you had already done exactly what I was setting out to do – and far better than I would have!! I went through the basic training back in 2005. It was complex and difficult to properly execute, and so I have only used TPM sporadically. But I so appreciate seeing the evolution and refinement of this intentional approach to mind mind renewal and transformation. It is apparent that you are refining this ministry, distilling it, and crystallizing it into to a very clear, concise, and understandable form so that it can be available and accessible to all. For me, these new, simplified materials are energizing me to begin to practice TPM much more regularly. May the Lord continue to bless you, your Dad, and this important work. Great presentation Joshua and thanks so much for providing the “slow internet” version as it worked like a dream with our snail version of internet here in Port Macquarie, Australia. Thanks also for the black and white version of the map which looks more like a flow chart and I think is easier to use as a prompt during sessions. Thanks a lot for the new material. May God help a lot of people with it. I’m looking for someone doing this in Tucson, Arizona, a friend would benefit from it a lot. If you know someone, please let me know! We have been using the MAP for one year now. Initially it felt limiting. However, we have gradually been seeing our sessions becoming more effective. What I see much more clearly in a session now is the Belief and Choice principle. When forward movement stops it is because they believe something. And because they believe something they are choosing to not move forward. These explanations and videos seem very thorough, accessible to revisit as needed, and deeply appreciated when even our own fears trigger while facilitating another! When introducing and explaining this wonderful gift, what questions prove affective in engaging people to see their need and willingly try this inner healing process? Please know that the articles and videos posted now is not the full training that will be released later. All of this information will be linked to the main training that is far more comprehensive. All of this information is supplemental to what is coming. 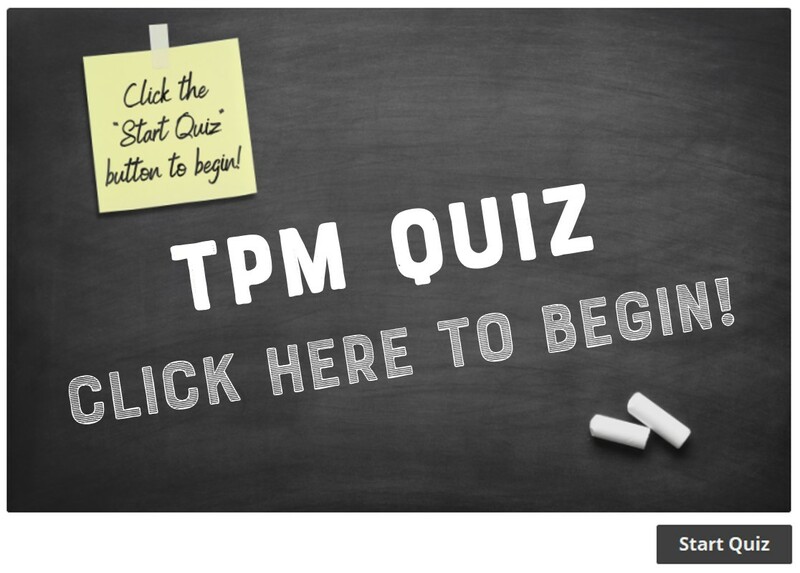 We are also developing a module that will be designed for the new person seeking to learn about TPM. This is where you will send your new people to answer their questions. Pray for us as we work on this training. It has been a major undertaking. We are also very appreciative of those who have chosen to partner with us in making this happen. I sure hope this was created with ease of translating it into other languages in mind! 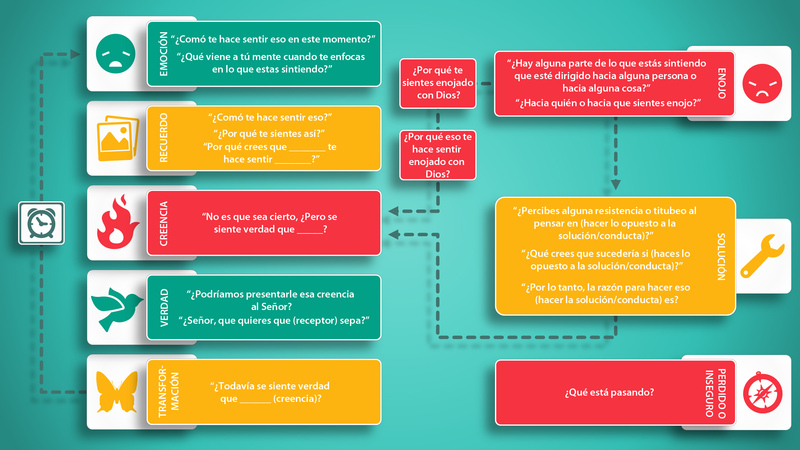 Translating this training is in the forefront of our thinking. Our objective is to take it to all the world. Once it is in English and tested and deemed ready, the translations will be merely a money problem. Since God does not have money problems, we will look to Him when that time comes. Pray for us. Thank you so much for what you are doing. It is so much clearer than the 2007 training. One question, though. When I try to print just the black and white page on the “process”, I get 21 pages of it. There is nothing else on the page. Well, I will say that it looks like some very faint print in the background, but it is not readable. Is there something I am doing wrong? Please help if possible. Hi Donna, thanks for the kind comment! First of all, be sure that you are only printing the image/picture, not the entire article (unless, of course, you want to print it all out). Secondly, check the ink levels on your printer to be sure that it is not low. And lastly, I would recommend printing it on a higher quality print setting (not draft) so that the text is as clear as possible. Keep on studying and sharing it with others! I noticed the alternate question for #3 in the “Solutions: The Three Questions in the De-Solution Tool (Pt. 3)” and I have now written it into my MAP. “How is (the solution) benefiting or serving you?” The goal of this question seems to be more obvious to a recipient and gets to the belief quickly. Thanks for that update. It’s really helpful. Just got to sit through your 15 hours of videotaping the “TPM Process” at Brookwood Church in Greenville, SC. Great teaching, and I think we all enjoyed how the two of you worked together. We’ll look forward to seeing how you boil all this down to the quality videos that you produce. It was a real privilege–thank you so much! Is there a place online to watch the 15 hours at Brookwood? I’ve seen some of the sessions here on the site, but still have some areas that need solidified. What I am really needing to see is a real session happening, or even a mock session but with the map being put to use. I need to see it at work, in other words. Can you direct me to something? We are still editing the Brookwood footage. Everything that you asked for is being developed. Please be patient and keep watching this website. It is posted as soon as it is complete. Do you have a section on TPM being used on the dissociative and ritually abused person? We do not do anything different with the TPM Process when working with dissociated people. However, you will likely be dealing with much “solution” based issues. You will want to learn all we have to offer in the area of SOLUTIONS, “Belief an Choice Principle”, principles of ASSOCIATION, and especially read the article in the SUPPLEMENTAL section of the training that addresses working with SRA.